Information from the Vietnam Coal - Mineral Industries Group (Vinacomin) showed that the Vinacomin delegation led by General Director Dang Thanh Hai has participated in the 2018 Clean Coal Conference in Tokyo. 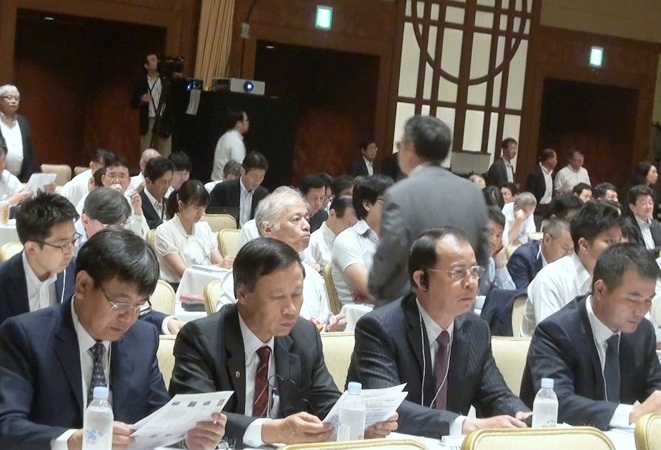 This is the annual international conference organized by the Japan Coal Energy Center (JCOAL). In the framework of the conference, General Director Dang Thanh Hai and Vinacomin delegation had the working meetings with the leaders of the Japanese agencies as Ministry of Economy, Ministry of Trade and Industry (METI), National Petroleum and Metallurgy Corporation (JOGMEC), Coal Energy Center (JCOAL). At the meeting with METI, General Director Dang Thanh Hai thanked this Ministry for the cooperation and helping the Vietnam coal industry in recent years, especially for the training - technology transferring projects for coal mining as during recent 17 years 1,727 trainees of Vinacomin have been trained. Mr. Hai expected METI to continue to support the extension of the training and coal mining technology transferring project between Vietnam and Japan, and as well as to support Vinacomin to carry out the projects related to the mine environment. Working with the JOGMEC, the two sides reviewed the cooperation contents in recent period, including the project for training and coal mining and survey - exploration technology transferring in Quang Ninh province. Mr. Hai suggested JOGMEC continuously to support the maintenance of training projects in both Japan and Vietnam coal mines as well as collaborative research in projects for improving and restoring mine environment, reverting post-mining environment, and treating soil and waste water. Working with Kushiro Coal Company, General Director of Vinacomin also asked specialists of the company to cooperate in developing new training contents and topics in line with practical needs of Vinacomin, including the contents of rehabilitation - recovery of mine environment for the sustainable development of Vinacomin in the coming time. In particular, working with JCOAL, General Director Dang Thanh Hai thanked JCOAL for its assistance in the implementation of the projects supported by METI and JOGMEC, especially the project for training and coal mining technology transferring. On this mission, General Director Dang Thanh Hai received and worked with the traditional coal customers of Vinacomin in Japan as Nippon Steel/Sumitomo Metal and JFE/ Marubeni. Japanese businesses would like to ask the Government of Japan to provide financial support for the development of coal mines in Vietnam. The parties also exchanged views to expand cooperation on new areas, particularly coal imports The parties also discussed to expand cooperation in new areas, especially coal import to Vietnam to meet the needs of the domestic market. General Director Dang Thanh Hai also met and encouraged the trainees of Vinacomin in Japan, asked them to strictly comply with the provisions of local law as well as the regulations of Kushiro coal company for leaving a good impression to Japanese people and counterparts on the image of Vietnamese engineers and mine workers, so that every trainee of Vinacomin would be a connecter to make the Vietnam- Japan friendship increasingly more and more developed.